Platforms: Windows XP/2003/Vista/7/8/8.1/10, 32 & 64-bit both. Sure, your handy desk or online calendar does a pretty good job of letting you know what date occurs ten days from now, but that's not heavy lifting. What do you do when you need to figure out a certain date that's way off into the future, or back in the past? If it's critically important to be correct, you can't leave that up to the figuring in your head! That's why you need to get a copy of today's discount software promotion, Advanced Date Time Calculator! Advanced Date Time Calculator is a powerful date and time calculator that can calculate result dates, differences in dates, days of the week, and more. With Advanced Date Time Calculator, you'll have control over the most finely detailed date and time calculations, down to the very second. What's more, if you ever need to convert units of time, like when you need to know how many seconds are in three months, Advanced Date Time Calculator will handle these types of tasks without nary a hiccup. You can even calculate how much time has elapsed since a specific UNIX base date, which is useful for many programming functions. Precision is the name of the game when you use Advanced Date Time Calculator. With support for decimals and a thousands separator for numeric fields, you will never need another temporal calculator other than Advanced Date Time Calculator! Please note folks, the program has a new main calculator which compares the specified time between local time zone and two other special time zones, and lists the times of all time zones in the world for the specified local time. Download available for: Windows XP/2003/Vista/7/8/8.1/10, 32 & 64-bit both. After you purchase Advanced Date Time Calculator it may be used indefinitely. 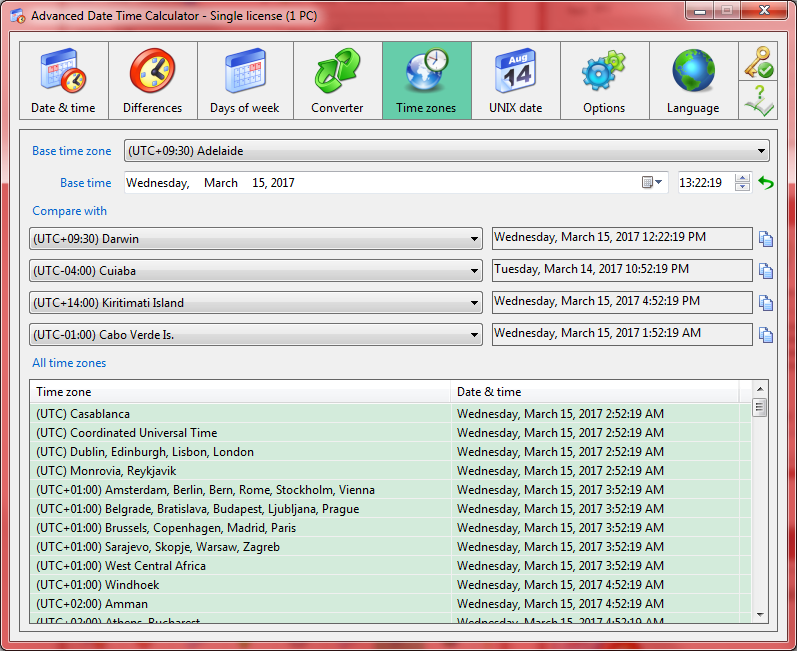 Advanced Date Time Calculator is licensed per computer, and not per user.